Here’s a list of questions I hope will be asked of Judge Neil Gorsuch, the President’s nominee to fill the vacant Supreme Court seat, at his Senate confirmation hearing. Most of these questions are related to security, individual rights, executive authority and requirements that the President serve without conflicts of interest. That these are necessary questions raises a larger question about whether, to paraphrase Benjamin Franklin, we will keep the Constitutional republic our Founders entrusted to us, as the President’s first weeks in power raise serious doubts about whether he intends to honor the law in all of these areas. The hearings come at a provident time and provide a much-needed opportunity to have a vigorous debate on Presidential power, made more meaningful by the fact that a Justice Gorsuch will likely join a Court that will make historic decisions on Executive authority. 1. Is it inappropriate for the President to demean and attempt to subvert the authority of judges who rule against him? (Credit for this question goes to Steve Vladeck who suggested this in the wake of the President’s reaction to Judge Robart’s stay of the Executive Order on travel). Are you troubled that the President has pre-emptively blamed federal judges for terrorist attacks because they have ruled against him? 2. There are reports that federal officials are refusing to comply with federal court orders staying the President’s executive order on immigration and travel. Is it permissible for the President or any Executive Branch employee to refuse to comply with an order from a federal court? If not, what should the Supreme Court do if called on to decide whether the President or the Executive Branch must comply with the Court order, assuming that the Supreme Court has upheld or declined to rule on the substance of the lower court ruling? If so, what is the legal basis for allowing the President or other executive branch officer to defy the courts? Would not this place the President above the law and destroy Article III Constitutional limits on Executive power? Just facts, no opinions. Brutal facts. Today, the President of the United States issued an order that stops our country from admitting this boy as a refugee. This is Omran Daqneesh, a five year old Syrian boy who was almost killed last summer when Syrian warplanes bombed his house in Aleppo. This picture was taken by medics who pulled Omran from the rubble after the attack. Omran’s brother was killed in the bombing. You probably saw this on the news last summer, when the attack on Omran and his family received a lot of coverage. The reason the President issued an order that bars our country from providing sanctuary to Omran is that, according the order, Omran might be a terrorist. Among the risks the President is concerned about, according to the order–Omran, and others the order bans from America, might commit crimes against women. This President is concerned about that. The President’s order does not allow our government to make an assessment of whether Omran is a terrorist or not, because all Syrians are banned from entering our country without any assessment of any kind. The President’s order does not allow our government to make an assessment of whether Omran is an innocent civilian whose life may be saved if he is granted sanctuary in the United States. In fact, there is nothing in the order that allows the American government to decide that Omran, Syrians, or those from other countries who are also banned, are perfectly innocent human beings who might well die if we do not grant them sanctuary. It would not matter under the order if Omran or the others banned are as innocent as you and me. 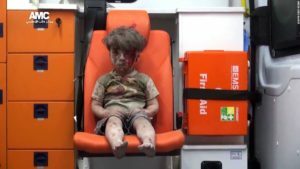 It would not matter if Omran is terrified that he might be killed. Under the order, Omran is not welcome in America. Period. And the naked reason for this is because Omran, and the other people banned from America, are Muslims against whom this administration intends to foster hate. Of course I chose this picture because it is hard to look away. Of course I chose this picture because if you have a heart, you cannot bear the idea that our country has no place for this boy, who suffered so much at the hands of grown men with no souls. And the truth is that there are tens of thousands of victims of violence who are just as innocent as Omran, and whose lives are just as sacred, who are in just as much danger, and who this order will ban from America and leave to suffer and die. More facts. Each one of us who is an American can decide if this is OK. We can decide whether our country is a country that will tell Omran that he is not welcome in America. We can decide whether our country is a country that will tell thousands of innocent people seeking sanctuary from the exact same terrorists we are fighting—or from regimes led by monstrous men– that they are not welcome in America. We can tell others in government that this order is wrong because it bans our country from granting humanitarian sanctuary to innocent people whose lives are at risk. And now an opinion. It is unforgivable for a nation with our power and our abundance to be so afraid that we would tell this wounded little boy, and other human beings who are just as vulnerable, that they cannot come to America. Trump is not a wolf in sheep’s clothing, or even a wolf in wolf’s clothing. Trump is a wolf in no clothing. His campaign, transition, and inaugural weekend lay naked the two driving forces of his presidency. The first is an authoritarian disregard for the truth—what we used to call “lying” in the good old days when facts were facts. And though bold-faced lying makes for hilarious Saturday Night Live skits (which these days write themselves), it’s dangerous when it comes with attacks on the press and political opponents. What the Trump administration is doing is the first step towards authoritarianism–an assault on the truth and those who tell it to establish the authoritarian as the only source of fact. Trump and his propaganda minions have lied about facts that are on film. He and his team have denied Trump said things he said on film. One of the most poignant moments of Barack Obama’s presidency was his eulogy for those murdered in the massacre at Charleston’s Emanuel African Methodist Episcopal Church. In the pulpit of that historic black church that served as a civil rights era sanctuary, and where a white racist extremist murdered nine African American parishioners who had just welcomed him, President Obama, America’s first black president, began to slowly sing Amazing Grace–a song often sung as an anthem of spiritual perseverance in the black church. A church filled with mostly black mourners followed. No one else in American political life could have filled that moment with a more moving expression of what was being felt. 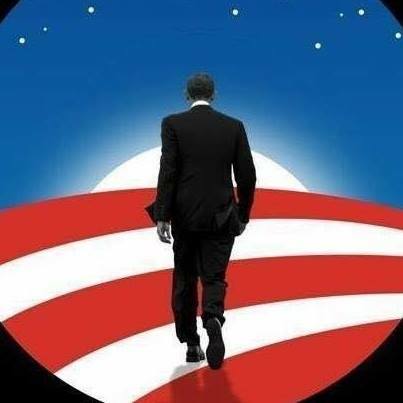 As I reflect on the Obama presidency, I am struck by how often, as I watched him, I had that thought—this man is special, and there is no one in our history who could have done what I was watching him do. Happy Birthday to Dr. Martin Luther King! In his honor here is his favorite singer, the majestic Mahalia Jackson, singing the theme song for the civil rights movement–“We Shall Overcome.” After that I’ve posted Dr. King’s soul shaking spoken word reflection on that song. All together they’re five minutes long and well worth a listen. I used to be a Senate staffer, and one of the most interesting parts of my job was helping Senators prepare for hearings. If I were a Senate staffer now, here’s hearing questions I’d recommend for President-Elect Trump’s national security nominees, Rex Tillerson (Secretary of State), General James Mattis (Secretary of Defense), and General John Kelly (Secretary of Homeland Security). These questions would serve as starting points for dialogue during the hearings and I’m sure would lead to other questions. In what ways was it a success? In what ways was it a failure? What conclusions do you draw from your assessments of successes and failures? What recommendations will you make to the President and Congress about U.S. strategy, including but not limited to use of force, in each of these nations? What should our goals be in each nation? 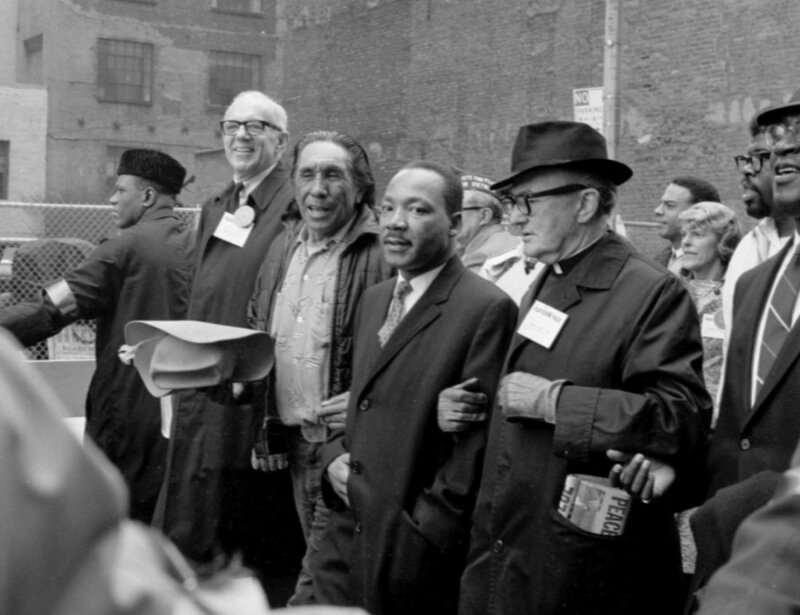 Before the election, I offered that I would write three posts on bridging the sharp divides that have us in warring camps–one on a unity agenda, the second on changes in the tone of our public discourse, and the third on increased civic engagement. Honesty is the best policy so I’ll start by saying that I did not think President-elect Trump would win. While I’m being honest, I’ll add that I’m a liberal democrat who found Trump’s victory deeply and personally devastating. To make all of this honesty even worse, what I will propose as a Trump unity agenda is largely what most would consider a progressive one. So why in the world would the President-elect humor a Bernie Sanders supporter (me) by implementing any of these proposals? Here’s why. First, I’m leaving out a huge range of issues on which agreement between Trump, Republicans and Democrats is not possible—taxes, financial regulation, gun restrictions, judicial appointments, climate change protection, much of national security policy, to name just a few. I’m not going to suggest that any of this should be part of a unity agenda because I don’t believe there’s a possibility of unity on these issues. Trump, the GOP (and I list them separately on purpose because I don’t think Trump is wholly aligned with his erstwhile party) and the Democrats are going to fight these out. Second, my recommendations will help Trump solve his not-so-long-term political problem—how does he keep the base that elected him while adding new supporters who opposed him. And he’ll have to do this to keep Congress in 2018 and get re-elected in 2020. Why’s that? Because he won less than 47% of the vote, because a switch of 80,000 votes in three key states would have beat him, and because there will be more of his opponents than supporters in future elections than there were this time. This means he’ll have to get more votes from blacks, Latinos, women, and younger voters than he did this time. And in 2018 and 2020, Trump will be on the ballot not as an idea but as an incumbent. He won’t be a blank slate on which angry voters can write what they want and vote for as a protest. He’ll be a real live office holder with successes, failures, unfulfilled promises, and unanticipated crises to which he’ll respond either well or poorly. He will lose friends he has now and need friends he does not have now. We Americans try to resolve the civil wars of other countries–sometimes heroically and successfully, sometimes clumsily, sometimes tragically worsening the violence. But these days, peace needs to start at home. We are in a civil war of words in our country. And not just words. The toxic violence in our political discourse comes amidst actual violence against many. Our presidential campaign has encouraged greater violence rather than diminished it. Violence against women has been celebrated by a candidate who has been accused of it. The lethal tension between black American citizens and police officers who serve our citizenry has been deepened and politicized, not met, as it should be, with bipartisan calls for reform that would save lives and improve policing. The debate in our presidential campaign is concluding with shocking threats and incitements to widespread political violence the likes of which our country has not seen in its modern life. A candidate has called for “second amendment” responses if he loses, charged that the electoral process is “rigged” against him, and refused to accept the electoral result if he is defeated. Some of his supporters speak openly of taking arms against the government and their political opponents. A Republican campaign office was firebombed in a hate crime the same week men openly displaying guns stood outside of a Democratic campaign office for hours. Thanks to the Duck editorial board for having me join to guest blog for the next six months. I’m looking forward to being part of the conversation here. I bring experience working with the Senate on humanitarian and national security issues, with non-profits on detainee treatment and disaster response, and in teaching which included a course on national security law as it relates to the conflict against ISIS. I’ve also volunteered in military hospitals and in the field after disasters, and watched relatives suffer from terrible illnesses like Alzheimer’s Disease. These last experiences, and the human suffering I have seen in the, have had a great impact on how I see foreign policy and national security . I hope to use my time with you to raise questions about whether we are right-sizing the threats we face and the resources we use to face them, whether we are correctly seeing how we can actually protect human security here and elsewhere. I’ve been part of political campaigns too and–particularly now–want to explore how our politics lead, for better or worse, to our policies. I’m very humbled to be part of the discussion of all of these important things with you, and look forward to learning about the issues I write about as I hear from you about them.